Step 1. The placement of the intake pipe in the Upper Niagara River allows water least affected by runoff to be drawn. Step 2. The water flows by gravity through the intake to the Low Lift pump station. Step 3. At the Low Lift pump station, water passes through screens to remove excess debris. Step 4. It is then pumped to the pre-treatment tanks where chlorine is added as a disinfectant. Step 5. Powdered activated carbon may also be added during the summer months to aid in taste and odor abatement. Step 6. In the rapid mix chamber, polyaluminum chloride (PACl) is then added to enhance particulate removal. Step 7. The water then travels to the flocculation basins. These basins gently mix the PACl and any particles allowing them to form a floc (an accumulation of particles). Step 8. The water then travels to sedimentation basins and the floc settles to the bottom of the basins. The water next flows into rapid sand filters. The filters remove any particles that remain. Step 9. After filtration, the treated water is chlorinated again and stored in reservoirs before being pumped into the distribution system. Step 10. As a service to the community, fluoride is added to help prevent dental cavities and a Poly-Orthophosphate blend is also added to inhibit lead and copper contamination. 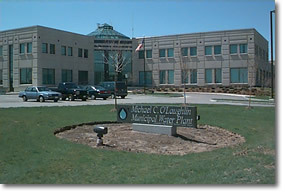 The mission of the Niagara Falls Water Board’s Water Quality Laboratory is to provide assurance that the drinking water we deliver is safe, clean, and meets or exceeds all local, State, and Federal drinking water health standards. The Water Quality Laboratory is certified by the New York State Environmental Laboratory Approval Program (ELAP) as well as the National Environmental Laboratory Accrediting Program (NELAC) and is inspected and tested several times a year. Tests include studies of the laboratories ability to accurately measure the quality of the water supply for various constituents. These “double-blind” tests confirm whether stringent laboratory standards are maintained throughout the year. Regular monitoring of the distribution system assures that the regulations set by the New York State Department of Health (NYSDOH) and the Environmental Protection Agency (EPA) are met. The NYSDOH and EPA regulations require water providers to regularly test public drinking water supplies for bacteria and other microorganisms, and numerous other natural occurring or man-made organic and inorganic constituents. Over the course of a year, our laboratory collects thousands of routine samples from various sites within the Water Treatment Facility as well as throughout the city distribution system (these sites were selected to represent the entire water delivery system). Each sample may be tested for numerous constituents and may include Coliform bacteria, Chlorine Residuals, Fluoride, Lead, Copper and other minerals, metals or man-made chemicals. In addition to the routine samples, regulatory studies for Cryptosporidium, Trihalomethanes and Haloacetic Acids, and Disinfection Byproducts are either in progress or scheduled for the near future. To receive a free “I Love NY Water” sticker click here!